CloudDDM’s setup at UPS’ worldwide hub in Louisville, Ky.
3D printing still a novelty? One startup wants to bring the tech phenomenon into large-scale manufacturing. 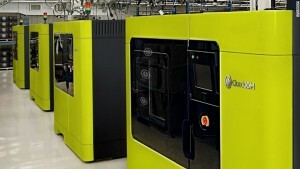 A week ago, CloudDDM unveiled a 3D printing factory embedded in the heart of UPS’ worldwide hub in Louisville, Ky.